On This Day – Drivetime – 12.12.1883 – Birth of Peadar Kearney, co-composer of the Irish national anthem. It’s probably the only song in existence whose lyrics are known by the majority of the Irish people in the first national language. 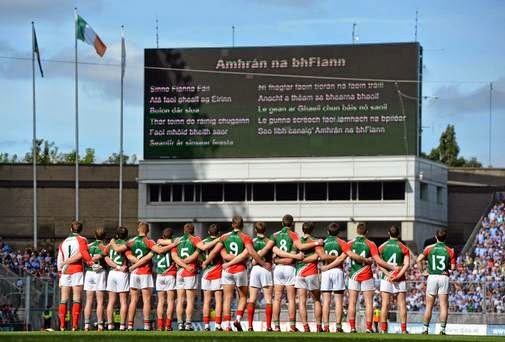 Ask yourself, when was the last time you were at an international soccer match or a significant Gaelic Games event and heard anyone signing the lyric ‘Soldiers are we, whose lives are pledged to Ireland’ as opposed to ‘Sine Fianna Fail atá faoi gheall ag Eirinn’. Which diminishes somewhat the acceptance of Peadar Kearney as the writer of the Irish National anthem. Kearney is the author of the lyrics of The Soldier’s Song which was adopted by the Irish Free State in July 1926 as our national anthem. It is said in some circles to have replaced God Save Ireland by Timothy Daniel Sullivan as the national anthem of the fledgling Irish state. However, this is a myth as, despite God Save Ireland’s iconic status, it was never formally adopted as anything other than a rousing, defiant, and frequently-sung Republican hymn. A Nation Once Again probably has equal claims to being the precursor of The Soldier’s Song but the fact is that the Irish Free State did not move to adopt a national anthem of any kind until 1926. Neither is it entirely clear if the lyrics and music of the song, or just the melody itself, constitute the Irish national anthem. Or whether anything other than the chorus has official status. Kearney was not really responsible for the melody, this was largely written by frequent collaborator Patrick Heeney to Kearney’s lyrics. The other problem is that the English language version has been almost entirely superseded by the Irish translation, Amhrán na bFhiann, written by Liam O’Rinn in 1923. When the song was played at the Ryder Cup in the USA in 2004 in its English language form it caused something of a storm in a tin cup. Confusion also reigned in 1994 when an American band played the utterly unfamiliar verses of the song as well as the chorus at Irish World Cup games. The Soldier’s Song appears to have been written in 1907, though Kearney himself suggested it was actually penned in 1909 or later. It became popular with members of the Irish Volunteers as a marching song. Kearney was a house painter by profession. His sister Kathleen would later marry another painter, Stephen Behan, making Kearney the uncle of Brendan and Dominic Behan. He joined the Gaelic League in 1901 – Sean O’Casey was one of his pupils in Irish language classes – and he took the Irish Republican Brotherhood oath in 1903. He was actively involved in the 1916 Rising and the War of Independence, becoming a personal friend of Michael Collins. Later he would take the Free State side in the Civil War, a move that certainly did no harm in the choice of his song as national anthem by the Cumann na nGael government of W.T.Cosgrave. He was a witness to the death of Michael Collins in Beal na Blath in August 1922 while travelling in the lead vehicle in the ill-fated convoy. There is some dispute as to whether Kearney earned royalties for the writing of The Soldier’s Song. He did receive some money from publishers for the original composition but not from the state when the song became the national anthem. Heeney, the composer of the music, had died in straitened circumstances in 1911. When Kearney applied for royalties he was informed by the state that it was the melody and not the lyrics that constituted the anthem. Later, under threat of a royalty suit from Kearney and Heeney’s brother the state agreed to buy out the copyright in 1933 for £1000. They had to do it all over again, this time for £2500, in 1965, after changes in copyright law. But that was of no benefit to Kearney. He had, like his collaborator, Patrick Heeney, died in relative poverty in 1944. He is buried in Glasnevin cemetery with Thomas Ashe, who died on hunger strike in 1917, and Pearse Beasley. Peadar Kearney, author of the, now rather unfamiliar, English language version of the Irish national anthem, The Soldier’s Song, was born 131 years ago, on this day. In July 1921, after more than two years of sporadic, vicious and often ferocious violence the British government, under external and internal pressure, decided that Sinn Fein, Dail Eireann and its military wing, the Irish Republican Army, were not going to go away. They sought and secured a truce during which agreement might be reached on the future governance of the 26 counties of Ireland where the Anglo-Irish war had been raging. That process began, inauspiciously from a Republican point of view, on 12 July 1921 when Eamon de Valera led a delegation to London for preliminary talks. In fact most of the talking took place in a series of bilaterals between de Valera and British Prime Minister Lloyd George. These encounters with the famous ‘Welsh Wizard’ may have been what prompted the Irish leader to absent himself from the full-blown talks that finally began in October. During their tete-a tetes Lloyd George had made it clear that the Irish sine qua non of a Republic, was not going to form part of any negotiations. Whatever the most compelling reason was for his decision not to travel it was Michael Collins, increasingly being seen as a serious leadership rival to de Valera, who was given the task of leading the delegation, with Arthur Griffith as his principal associate. The delegates were given plenipotentiary powers to ‘negotiate and conclude … a treaty or treaties of settlement, association and accommodation between Ireland and the community of nations known as the British Commonwealth.’ However, Collins was also handed a note from Dev that reference had to be made to the Cabinet in Dublin before any agreement was signed. Leading the formidable British delegation was Lloyd George himself, aided by, among others, future Prime Minister Winston Churchill. Offering valuable administrative and advisory support was the Prime Minister’s secretary Thomas Jones. Both men were Welsh speakers and were not averse to rattling the Irish delegation by breaking into Welsh with each other in the course of negotiations. Lloyd George concentrated on developing a personal relationship with Collins and Griffith. The refusal of the British to concede a Republic had led de Valera to devise an ingenious form of external association that recognized the Crown while mimicking many of the attributes of an independent Republic. This approach, more or less, passed muster with the British delegation. The issue of Ulster was more problematic. The Irish had been told to break off discussions on the issue of partition – which is somewhat ironic as it played a negligible part in the later treaty debates in Dail Eireann. However, Lloyd George managed to persuade Griffith in a private meeting, not to break on Ulster. He was later held to this guarantee at a crucial point in the talks. Collins was also having problems with his delegation. The secretary, Erskine Childers, objected to any major concession on a Republic, while two of the delegates, his cousin Robert Barton and the London-based solicitor George Gavan Duffy, were getting restless at their exclusion from the many private meetings involving Collins and Griffith. As the talks moved from November into December 1921 a combination of threats and cajolery began to wear down the Irish plenipotentiaries. Eventually, on the evening of 5 December, they were told by Lloyd George to take or leave what was on offer from Britain or risk bearing personal responsibility for the resumption of, in his own words, ‘immediate and terrible war’. 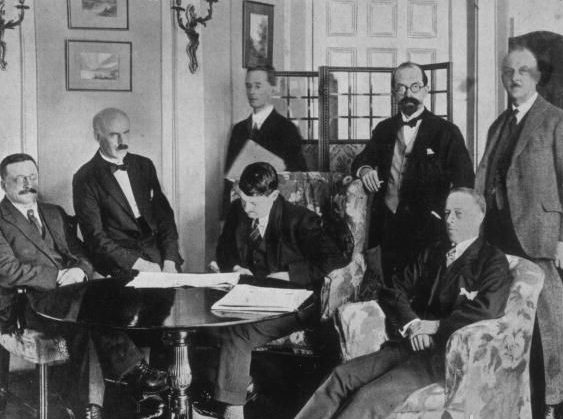 The Irish delegation succumbed and signed the treaty the following day. Later Collins wrote prophetically to a friend ‘early this morning I signed my death warrant. I thought at the time how odd, how ridiculous —a bullet may just as well have done the job five years ago’. The British delegation to the Anglo-Irish talks threatened to resume the Anglo-Irish war 93 years ago, on this day. It has become known as the ‘Old Lady of South King Street’. The Gaiety is now a venerable theatre which has managed to survive some lean times and very stiff competition and remain with us today. In 1871, however, it was brand new, luxurious, well-appointed, and it accommodated almost 2000 people, 700 in the pit and stalls, 200 in the balcony, 210 in the upper circle and a further 700 in the gallery – known to one and all as ‘The Gods’ because the seats were closer to heaven than they were to the stage and patrons required the eyesight and hearing of an all powerful deity to follow what was going on many metres below them. 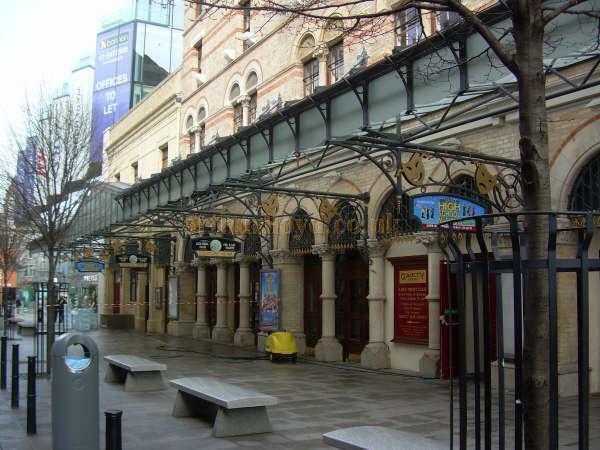 Despite competition from the Olympia, which opened eight years later, and other sizeable venues, like the Theatre Royal, the Gaiety quickly became a fixture on the Dublin scene, attracting many visiting companies like that of the great actor-manager Henry Irving and the d’Oyly Carte Opera, spiritual and contractual home of the works of Gilbert and Sullivan. The Gaiety was not unaffected by the various excitements of the revolutionary decade. During the Easter Rising members of the Rathmines and Rathgar Musical Society, another bi-annual tenant, had been ‘trapped’ in the Shelbourne Hotel by the hostilities. There are, it has to be said, far worse places to be imprisoned, and the Shelbourne was out of range of the revolver prominently sported and rebelliously employed by the excitable Countess Markievicz, second in command around St.Stephen’s Green during the rebellion. At least the R&R was only in rehearsal. The d’Oyly Carte had already arrived in force for their traditional Easter week shows at the Gaiety when Pearse, Connolly, Plunkett and units of the Irish Volunteers and the Irish Citizen’s Army took over the GPO. As fortune would have it the Gilbert and Sullivan players and stage crew had been booked into the Gresham hotel across the road in Sackville street for the week. Discretion proving to be much the better part of valour the company members never left the hotel and the Gaiety, sadly, did not ring to the strains of I am the very model of a modern major general or A policeman’s lot is not a happy one that Easter. J.P.Donleavy’s controversial novel The Gingerman. The play, due for a two week run, was pulled after three nights. According to Donleavy himself Elliman was visited by McQuaid’s private secretary who requested, or advised, him, to close the show down. Elliman, opted to comply rather than take on the crozier. Were it not for the intervention of the second saviour of the Old Lady of South King Street in 1965 the Gaiety might now be an office block or a very expensive car park. The venue faced stiff competition not just from other theatres but from cinema and television. In the final five years of the reign of Louis Elliman only seven productions turned a profit for the Gaiety management. Elliman died in November 1965 at the age of 59. The Gaiety, fortunate to survive as a theatre, was sold in 1966 and was, at the time of its centenary, being run by Eamon Andrews studios in the shape of the redoubtable Fred O’Donovan, a worthy successor to Elliman. He held the reins for almost twenty years and, with the help of Maureen Potter, heir to the great Jimmy O’Dea, the Gaiety survived. In its latter years one of the theatre’s most entertaining, if bizarre, moments was when it re-opened after re-furbishment with a ‘Night of 100 Stars’ in October 1984. One of those stars was either an idiosyncratic or intoxicated Peter O’Toole whose five-minute slot reading an extract from Swift’s Modest Proposal morphed into a twenty minute rendition of the entire essay. This led to hisses, catcalls and walk-outs from members of the well-heeled audience. They were either offended by the Hollywood star’s invocation of 18th century Dublin poverty, or bored by the length of time it took him to read the viciously satirical piece, advocating the fattening and slaughter for profit of babies by impecunious Dubliners as a handy source of revenue. 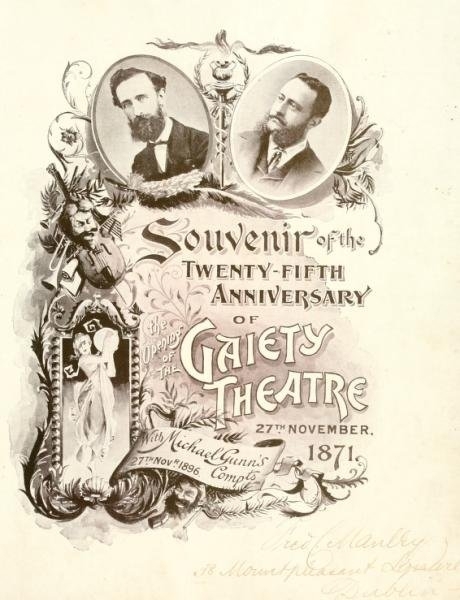 The Gaiety theatre opened its doors for the first time 143 years ago, on this day.